Syncope is a condition which presents the emergency physician with significant diagnostic challenges, not least of which because the patient has, by definition, recovered from the index event. It is a common presentation with an estimated incidence of 6.2 per 1000 population in the Framingham Study(1), accounts for 3-5% of Emergency Department (ED) attendances and 1-6% of urgent hospital admissions. The incidence is not constant throughout life, but rises sharply over the age of 70 years with further rises over the age of 80 in women. In elderly patients in long term care, the incidence can be as high as 6%. The Framingham Study found that around 30% of patients with syncope had more than one episode. For a single episode of syncope, prognosis varies greatly and is related to the underlying cause. Identification of the underlying cause following a single episode of syncope can be challenging. Costs of investigation are of the order of 2,000 per patient in the UK with a diagnosis being made in approximately 50% of cases. The role of the Emergency Physician is pivotal in risk stratifying serious from non-serious causes of syncope and ensuring appropriate intervention when required while at the same time avoiding unnecessary investigations. 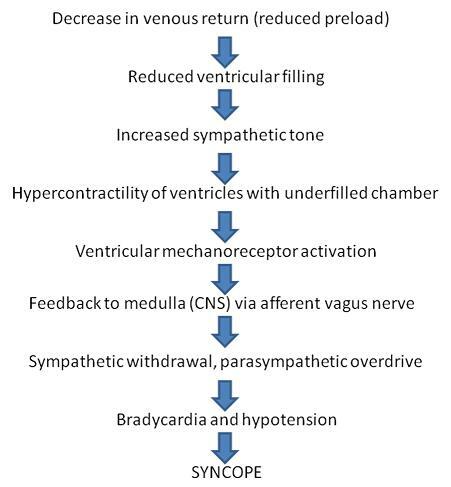 Neurocardiogenic syncope or vasovagal syncope (35-50%): This arises from an initial increase in sympathetic outflow followed by a rebound reduction in sympathetic activity leaving unopposed parasympathetic activity causing vasodilatation, bradycardia and hypotension (see Figure 1). Cardiac (10-30%): arrhythmias, cardiac failure, ventricular dysfunction (eg. hypertrophic obstructive cardiomyopathy HOCM) and valvular heart disease can all cause syncope. Orthostatic syncope (10%): defined as an orthostatic drop of >20mm systolic blood pressure or >10 mm diastolic blood pressure. This may be due to absolute volume depletion from dehydration or haemorrhage or to venodilatation caused by medications or autonomic insufficiency (eg as occurs in Parkinsons Disease). Neurological / psychiatric syncope (5%): Neurological causes of syncope include basilar artery migraine, vestibular dysfunction and vertebrobasilar ischaemia. Psychiatric syncope is a recognised syndrome consisting of syncopal episodes found in anxiety, depression and conversion disorder that resolve with treatment of the psychiatric disorder. A key cause of orthostatic hypotension in the elderly is prescribed medication. Syncope presents the emergency physician (EP) with a unique challenge: by definition, there will have been full recovery from the index event, approximately half of these patients will never have a cause identified and the majority of the remainder will have a benign underlying problem (eg. vasovagal syncope). The key for the EP is to risk stratify patients into low risk (the majority) and high risk by taking a careful history, performing a focussed clinical examination and, where necessary, ordering a limited number of basic investigations. In particular, in addition to recognising orthostatic aetiologies (hypovolaemia or drug-related) it is critical to identify those patients who may have an underlying cardiac pathology for their syncope; the history and examination will be largely directed towards identifying cardiovascular abnormalities (cardiac failure, valvular problems, arrhythmias, etc.) that may require further investigation. A systematic approach to syncope can allow for the safe discharge of the majority of patients without the use of expensive and inappropriate investigations. A careful history will give key information indicating the potential cause of syncope. The first key point in the history is to confirm that the presentation was actually syncope; it must be differentiated from conditions such as seizures, collapse without loss of consciousness (drop attacks), and vertigo. Circumstances: what lead up to the episode? Duration: how long was the period of loss of consciousness? Associated symptoms: was there chest pain, breathlessness or palpitations? Was there a prodrome? Position: was the patient supine, sitting or standing? Activity: did the episode occur at rest; after a change in posture; during or after exercise; during or after urination, defecation, cough or swallowing? Predisposing factors: was this in a crowded or warm place; after prolonged standing; or after a meal. Were there precipitating events? Post recovery symptoms: was there nausea or vomiting? Was there incontinence or tongue biting? Was there a confusional state? A witness account is often critical in helping to determine a cause: was there cyanosis or pallor? Were there movements suggestive of a fit? If so did it occur before or after the collapase? Relevant comorbid diseases: particularly previous cardiac disease, diabetes, Parkinsons disease, etc. Relevant family history: is there a family history of sudden death (could indicate underlying arrhythmic disorder eg. Brugada syndrome)? Relevant drug History: specifically ask about cardiovascular drugs (eg. beta blockers, ACE inhibitors, nitrates, calcium antagonists, digoxin, diuretics, antiarrythmics) and other drugs (eg. phenothiazines, insulin). The majority of patients with syncope will have a normal physical examination. However, it is important to exclude serious underlying pathology in the minority. Although syncope is often seen as a neurological presentation, cardiac causes of syncope are more common than neurological (and often carry a poorer prognosis), and so a thorough cardiovascular examination is required. It is crucial to identify evidence of cardiac failure or valve lesions. Tachycardia and hypotension could indicate volume depletion and a cause should be sought. Orthostatic hypotension (a drop of systolic BP of at least 20 mm Hg on standing) is common particularly in the older patient. Its presence does not exclude the possibility of a more serious cause of syncope. While a neurological examination may turn up incidental abnormalities in the presence of a history of transient loss of consciousness, abnormalities on neurological examination rarely point to the diagnosis; conversely, a normal neurological examination does not exclude a neurological cause of loss of consciousness. Tongue biting indicates a seizure as a cause of loss of consciousness. However it is an insensitive sign and its absence does not exclude seizure. Ejection Systolic Murmur Crescendo-decrescendo murmur; usually harsh and low pitched. In the presence of features of ventricular hypertrophy is suggestive of aortic stenosis or outflow obstruction. The murmur of hypertrophic obstructive cardiomyopathy (HOCM) is unusual in that it is one of the few murmurs that increases in intensity when the patient stands up. 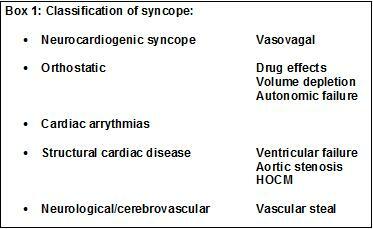 Syncope must be differentiated from other causes of loss of consciousness with full recovery which do not fulfil criteria for definition of syncope (ie. transient loss of consciousness with full recovery due to temporary reduction in cerebral perfusion). As previously noted, clinical examination is often normal in syncope, so differentiation from other causes of collapse is usually based on the history. It is important to make an accurate diagnosis as overdiagnosis of other conditions is common and can result in prolonged and expensive investigations with a low yield, particularly investigations for suspected epilepsy, transient ischaemic attacks or cardiac pathology. Epileptic seizure May be preceded by aura. Post ictal state common. Unlikely if recovery is rapid. Cardiac arrythmia Abrupt onset of loss of consciousness; rapid recovery. Past history and risk factors common. Unlikely in younger patients in the absence of cardiac history; exercise induced syncope; may be associated with cardiac signs or abnormal ECG. Cardiac outflow obstruction Symptoms on exercise; rapid recovery usual. Absence of murmur at rest does not exclude cardiac outflow obstruction. Unlikely in the absence of mechanical valves, exertional murmur, or evidence of ventricular hypertrophy. Pulmonary Embolus Abrupt loss of consciousness. Tachypnoea usual after recovery. Unlikely in low risk patients. Associated injuries: injuries may be caused by collapse and investigation of the cause of collapse should not prevent a search for associated injuries. Possibility of more than one cause of collapse: particularly in elderly patients it is common to have two or more possible causes of loss of consciousness and the presence of one does not preclude the presence of others. Increasing frequency of collapse is suggestive of cardiac causes of syncope and in the presence of cardiac pathology is an ominous sign. Simple syncope during exercise is rare. The presence of exertional syncope is strongly suggestive of either an arrhythmia or a structural cardiac abnormality (eg HOCM). Once a thorough history and focussed examination have been performed, this information needs to be put together with limited ED-based investigations to complete a robust risk stratification of your patient to determine the need for further investigation and/or urgent admission. There are two main risk scoring systems in current use: the OESIL score and San Francisco Rule. Both have been well validated for use in the ED. These scores are designed to identify patients who are at low short term risk of serious adverse events following syncope and who can safely be investigated as outpatients. A third risk stratification tool, the EGSYS score has been developed and validated in a smaller patient group to identify patients at high risk of cardiac syncope. There is considerable scope for further research to develop simple scoring systems that will have the high sensitivity of the current systems but improved specificity. The American College of Emergency Physicians Guideline on syncope recommends (based on class B evidence) that patients with syncope and evidence of heart failure or structural heart disease or patients with syncope and other high risk factors (older age, haematocrit < 30%, abnormal ECG or history or presence of structural heart disease, coronary artery disease or cardiac failure) should be admitted. “Older age” is not defined. The score predicts 12 month mortality which rises from under 1% for patients with no risk factors to over 50% in patients with all 4 risk factors. The presence of any factor is considered sufficient for the patient to be high risk. In the original validation study, the incidence of serious adverse events was 6.7% with the rule being 98% sensitive and 56% specific to predict adverse events. This specifically identified cardiac syncope with a score of 3 or more being 99% sensitive and 65% specific for identifying cardiac syncope (positive and negative predictive values 33% and 99%). A bedside glucose estimation (BM) is a simple investigation that will pick up some cases of hypoglycaemia (and hence exclude syncope as a diagnosis). An ECG is an essential initial investigation: a completely normal ECG (as opposed to an ECG with non-specific changes) makes a cardiac cause of syncope other than transient arrhythmia unlikely. Measurement of haematocrit is required to complete the San Francisco Rule to identify which patients can be safely discharged. By this stage a history, examination and limited ED-based investigations will have allowed appropriate risk stratification. High risk patients will require admission for further urgent investigation and appropriate intervention. Low risk patients can be discharged, a proportion of whom may require further investigation which can appropriately be performed as an outpatient. Echocardiography should be performed in any patient with a cardiac murmur and should be used to diagnose and quantify heart failure when this is suspected. If aortic stenosis is suspected, echocardiography should be performed urgently. This will commonly be done as an inpatient. Carotid sinus massage for 5 to 10 seconds with continuous ECG and blood pressure monitoring can be used to diagnose carotid sinus syndrome. It is considered positive if it produces a drop in systolic blood pressure of 50 mm Hg or a period of asystole of 3 seconds. Ambulatory 24 hour ECG recording may be considered in patients with a high pre-test probability of arrhythmia. However, in the absence of a history of palpitations it has a low yield in syncope (under 5% even in populations with a high incidence of arrhythmia). An alternative with a higher yield (around 25%) is ambulatory loop recording. In this the patient wears the device for a period of weeks and presses a button when they become symptomatic. This triggers the device to record a 5 to 10 minute ECG recording after the button is pressed. However many patients lose consciousness before pressing the button. Tilt table testing involves slowly moving the patient from supine to standing with a cardioinhibitory or vasodepressor response being considered positive for neurocardiogenic or vasovagal syncope. Protocols vary and various provocative drugs may be used. Although serum prolactin has been measured in the past to distinguish between syncope and seizures, it has not been shown to be of use in this circumstance and its use should be abandoned. Management in the ED for patients who have presented with syncope is naturally limited by the fact that, by definition, they have made a full recovery from their index event. Intervention in the ED is essentially geared towards achieving robust risk stratification (as described previously) and confidently discharging patients at low risk with no follow-up (ie. normal examination, no risk factors), whilst identifying those who require either (a) admission for urgent investigation (eg. patients with cardiac failure or suspicion of aortic stenosis) or (b) further out-patient investigation (eg. patients with mild orthostatic or vasovagal syncope). Failure to consider more than one cause: in one study 18% of patients with syncope had more than one cause. Failure to assess associated injuries: any patient with loss of consciousness may injure themselves. It is easy to concentrate on the cause of syncope and ignore the associated injuries. Failure to recognise the importance of increasing frequency of syncope: cardiac causes of syncope are more common in patients with recurrent syncope. Increasing frequency of syncopal episodes can therefore be a marker of deterioration in a cardiac disorder. Failure to recognise the significance of exercise associated syncope: although most cases of exercise associated syncope are benign, in a significant minority the cause is a serious cardiac cause that can lead to sudden death. Differentiation between a benign flow murmur, aortic stenosis and subvalvular obstruction (ie. HOCM) can be difficult. As a rule a shorter (rather than a quieter) ejection systolic murmur is more likely to be benign. The murmur of HOCM is unusual in that it becomes louder on standing up (due to decreased venous return reducing the size of the heart). Echocardiography is a cheap, safe and readily available investigation and any patient with a murmur in the context of collapse warrants echocardiography. Exercise associated syncope is defined as syncope occurring during or immediately after exercise and accounts for 3 to 20% of cases of syncope. Although most cases are benign, patients with exercise associated syncope include groups of patients at high risk of sudden death. Serious causes to be considered include arrythmogenic right ventricular dysplasia, Brugada syndrome and HOCM. Although there can be pointers to these at presentation, there may not be: in all of these conditions the ECG may be normal or may show non-specific changes; and the murmur of HOCM may not always be heard. Syncope is increasingly common with increasing age and the great majority of patients presenting to the ED with syncope will be aged over 65. Older patients have a wide range of problems likely to cause syncope: e.g. resting cerebral perfusion may not be much above the minimum level needed to maintain consciousness, there may be a poor baroreceptor response, there may be a degree of cardiac failure, and drugs that can cause syncope are commonly taken by the elderly. In addition, although neurocardiogenic syncope is more common in older patients, 10% of elderly patients without neurocardiogenic syncope have a positive tilt table test. Syncope is a common presentation that is usually benign (Evidence grade 1a). Syncope accounts for around 3-5 % of Emergency Department attendances and 1-6% of admissions. Annual incidence is around 6 cases per 1,000 population (Evidence grade 1b). A cause for syncope is often not found. However the common causes are vasovagal syncope, orthostatic syncope and cardiac causes including arrythmias and structural heart disease (Evidence grade 2a). It is possible to risk stratify patients according to risk based on history, examination and a few simple investigations (Evidence grade 1b). Most patients will require no further investigation or follow up (Evidence grade 1b). Low risk patients requiring further investigations can be safely investigated as outpatients (Evidence grade 1b).